In the spirit of "sustainable zoom-zoom" — their words, not ours — Mazda has finally revealed the Kazamai, the mystery compact crossover bowing at the Moscow International Auto Salon August 26. Kazamai means "swirling crosswinds," and if you think you're seeing a heaping helping of Nagare design language, you're spot-on. Of more interest, the release mentions a next-generation direct-injection engine and a "new transmission," though we'd imagine that those too are currently concepts that won't see the light of day for a while. Full release after the jump. HIROSHIMA, Japan—Mazda will unveil a sporty, compact crossover concept vehicle, Mazda Kazamai, at the Moscow International Automobile Salon (MIAS) on August 26. Kazamai, which means "swirling crosswinds" in Japanese, expresses the powerful yet nimble image of a stylish and compact crossover. The concept is based on Mazda's long-term vision for technology development, Sustainable Zoom-Zoom, which aims to provide a unique balance between sporty driving fun and superior environmental and safety performance. Kazamai will be joined at MIAS by the Russian debut of Mazda's CX-9 SUV, which was crowned 2008 North American Truck of the Year in February. The Kazamai concept further evolves Mazda's 'Nagare' design language by fusing Nagare's 'flow' design cues with aerodynamic proportions. The design features panel lines inspired by crosswinds in nature which evoke visual lightness. Its bold five-point grille, accentuated front wheel arches and sleek roof line, combined with large 22-inch wheels, lend it high emotional appeal. Sporty to look at, Kazamai is meant to be spirited and fun to drive, with compact dimensions. Kazamai's four-wheel drive powertrain will consist of a next-generation direct injection engine and a newly developed transmission. It is also aerodynamic, with an evolved lightweight body structure and enhanced the vehicle safety attributes. Were it to be built, Mazda's latest show car would deliver exciting driving dynamics, frugal fuel consumption and greatly reduced CO2 emissions. 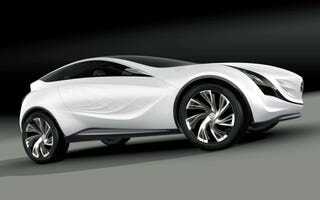 The Mazda Kazamai promises to be another ground-breaking show car from Mazda Design, winner of this year's Grand Prix du Design in Paris. Created especially for the Moscow International Automobile Salon, it gives a good indication of where Mazda is going with a possible future compact crossover. And in Russia's growing automotive market, compact SUVs are the second-largest segment, representing about 13 percent of all new car sales. Complete information will be made available immediately after Mazda's press conference at 10:15 a.m. local time, on August 26 at the Mazda stand.